We call this the poutine dream... Just make sure you use a tender cut of beef. Your diners' jaw muscles will thank you! Prepare the beef steak with a meat mallet. Crumb the steak with the corn flour, eggs and then polenta. Peel, dice and roast the sweet potatoes until golden. Combine the cream and cheese together and heat gently until cheese is melted and combined. Combine the black pepper, white pepper and cayenne pepper with the water. Add the KNORR Jus and KNORR Gluten Free Rich Brown Gravy and whisk until boiling. 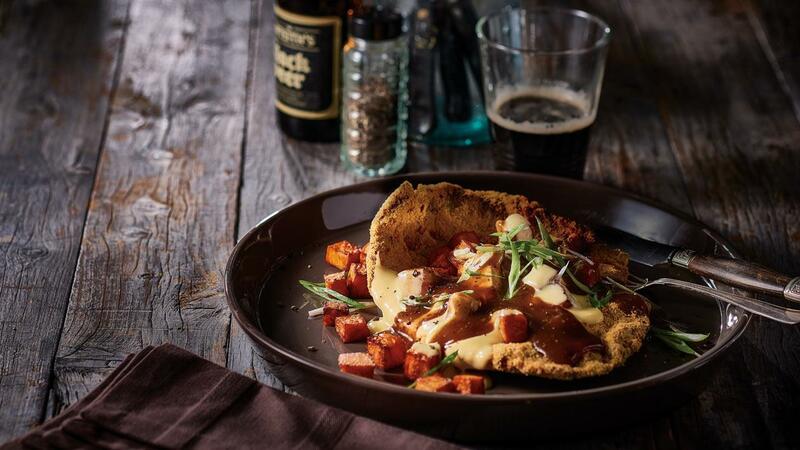 Serve the schnitzel with the sweet potato, cheese poutine and gravy and garnish with sliced green onion.